For other uses, see Rapana (disambiguation). 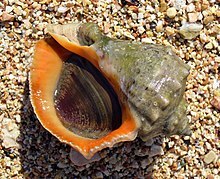 Rapana is a genus of large predatory sea snails, marine gastropod mollusks in the family Muricidae, the rock snails. ^ Schumacher H. C. F. (1817). Ess. Vers test. 65: 214. Wikimedia Commons has media related to Rapana. This Muricidae-related article is a stub. You can help Wikipedia by expanding it. This page was last edited on 6 February 2018, at 04:39 (UTC).